Have you tried the Easy Credit Card Verifier before? If yes, please consider recommending it by clicking the Facebook "Recommend" button! This download is 100% clean of viruses. It was tested with 27 different antivirus and anti-malware programs and was clean 100% of the time. 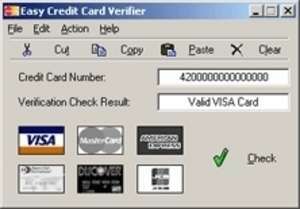 View the full Easy Credit Card Verifier virus and malware test. The file that was tested: ecverify.exe . Tip: If you're experiencing trouble downloading this file, please disable any download managers to Easy Credit Card Verifier you may be using. If you're receiving a 404 File Not Found error, this means the publisher has taken the file offline and has not updated their links with us for Easy Credit Card Verifier. Please do drop us a note in the event of a missing file. Ashkon Software LLC provides their software as a Windows Executable file and therefore installation is as easy as downloading the file ecverify.exe and running it directly after retrieving it. We highly suggest using antivirus software before running *any* files from the Internet. The company hosting this file has a trust rating of 5/10. Calculators - This is a simple 10-digit display calculator with a large display and large buttons, styled after the big hand held calculators found in stores. It can add, subtract, multiply and divide, and has a memory feature as well. This calculator is meant for simple calculations (limited by 10 displayable digits), and should not be used for determining rocket trajectories, amortizing the national debt, or doing your math class homework. Calculators - Alternative Windows Calculator with 2 views and general functions. Colorful.